I just picked up a 2005 997 C2, without the Bose system. I'm finding it hard to find any info on replacing the stock speakers. I'm very willing to run with a 2 way separate (mid-bass and tweeters), but I'm trying to find out this info and there's not much out there. Hopefully someone can help. - What size speakers are in the door and the dash? - Where are the crossovers, are they inline with the speaker or separate module? - Anyone have separates they recommend? - I've heard the Hertz make drop in speakers, but they're pretty pricey, any comments on these? - Is it possible to add a subwoofer behind the main seats, if so how do you get a line-out for the sub-amp? - Last question, is there instructions on removing the stock speakers anywhere? I have been on a similar search, and the news is not necessarily good! First of all, the signal output is digital and is proprietary (MOST-BUS). So you can't touch it. You can patch into the speaker level outputs with a JL cleansweep, but it is not a seamless operation. I don't think that anyone knows what the frequency response is on each channel, but they are rumored to have both equalization and have been filtered though a crossover. ('rumors' are about the best you get in this category! LOL) I don't think anyone has yet determined the impedence of the stock speakers. But they are rumored to be in the neighborhood of 4 ohms. I believe that the crossovers are active and are upstream, either in signal source or at the amp. The easiest way to add a sub seems to be to sum the rear speaker outputs by using an amp that accepts speaker level inputs and has a mono function. Who knows if the rear speakers are full range. But at least you only have to find a nice ground, and run a cable to the battery. Most amps have a signal sensing turn-on, so you don't need switched power. Anyway, I have a similar dilemma, since I want to tinker with the stock setup without gutting the car or putting in glitchy equipment. I was once a car audio installer and did not mind cutting a honda up and having ground loop problems. I can't imagine ruining a 997 like that. Porsche has made a very very difficult system to patch into, and it seems that nobody but high end pro shops go near the system. ^I would go with a high end pro shop...someone with known experience. The car is a high dollar car, even if you got a good deal on a used one. In order to keep it's integrity, go high-end. Check out Marin Auto Stereo and Alarm...they are know to work on expensive cars. Honestly, the stock speakers sound pretty good and appear to have lightweight neodymium magnets. All you need is a subwoofer and more power and the whole system will sound fantastic. Keep it simple and lightweight and stealth. You can tap off the speaker wires into an amplifier that can take speaker level inputs, and the JL Audio HD600/4 is perfect. It is a tiny digital D-class, 600 watt 4 channel amplifier that is just small enough to fit under the passenger seat, at least my seats, contains a variable electronic crossover, and an adjustable input that can take either low level or high level speaker type inputs which is what you will need in this case. Weight is about 8 lbs. Here it is mounted on a modified cutting board from Target that uses speed clips to mount to the existing sheet metal holes on the floor pan, so no holes are drilled into the car. The amp is set up to provide 150 watts per left and right channel, crossed over at 80 hz @ a 24 db/oct slope. There are no rear speakers. The other two channels are bridged to provide 300 watts to the subwoofer, crossed also at 80 hz with a 24 db/oct slope. The subwoofer is a single Image Dynamics 8" driver contained in a sealed and stuffed 0.23 c.f. enclosure in the front passenger foot well and is easily removable by one nut. Total weight of the subwoofer and enclosure is 14 lbs. This location places the weight forward and low, and opposite the driver for best balance, as opposed to behind the rear seats. Compensating for adding the additional weight, a 24 lb Westco Miata battery replaces the stock 45 lb Moll battery, along with a 0.5 farad cap beside it to provide the amp sufficient current under hard bass transients. Below you can see the subwoofer enclosure before it is finished and covered with black Silverknit carpet, which is a good match to the factory carpeting. Such a system should be more than sufficient for most people and the single I.D. 8" goes pretty deep and hits hard, more than enough to vibrate everything in the car including the mirrors and roof metal. After plotting the T/S parameters of many different subwoofers in BassBox Pro, the I.D. 8 was chosen because it is not too deep, or heavy, can be placed in a very tiny enclosure, and has a xmax (one way linear stroke) of 17mm (double that of many subwoofers) for high SPL. If after all this, it is still not enough for you, and you still want to replace the door woofer and dash tweeters, the consider the new Focal Kevlar165 KR2 or KRX2. http://www.focal-america.com/ In the door, you can fit up to an 8" woofer. The dash contains a pair of 1" tweeters. Thanks Steve! I have been looking for a lot of this info for a very long time. Just a few questions: In the stock system, is there an external AMP or are the speakers driven out of the PCM/Head Unit? If there is an AMP, where is it?? I know where the Bose model-amp is, but not the stock system's. I also noticed that you placed the amp under the driver's seat, I have a 'black box' there, that I thought was the proprietary ECU for the seat/airbag sensors. Is that the AMP? Also, which speakers outputs did you input to the Amp? And where did you tap into them? Sorry for the millions of questions, but I have asked about 100 people how to do just what you have right there, and got 100 totally different answer!!! With the non-Bose systems, there is an internal amp in either the CDR24 or PCM. You can tell by the back of the unit as the one with amps have the rows of round aluminum dimples passing through the back of the case for the internal amplifier heat sink. It probably doesn't output more than 15 w/ch. Bose head units do not have this amp and the back of the case is completely smooth. 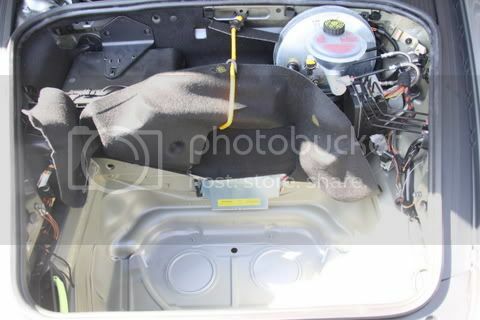 Cars with the upgraded sound option have a larger power amp in the trunk, mounted vertically on the left side against the gas tank, and covered with what looks like a small shoebox sized black plastic add-on. If you have a separate amp, it's still best to tap off the speaker outs from the head unit for a cleaner signal. It's best to tap to the output right off the connector behind the head unit. I just cut the left and right front speaker outputs about 2" after the connector, and fabricated a pair of cables from there to the RCA inputs of the new amp. I ran the speaker outputs from the amp back to the speaker wires I cut behind the head unit. There is a delayed off antenna/amp turn on out that comes out of the head unit that you'd use to turn the amp on/off. I forget where I downloaded the head unit pin outs, but if you do a search on http://www.renntech.org or the http://www.planetporsche.net/forums.php forums, you will find it. The JL amp you are looking at is placed under the right passenger seat. I don't think there's room under the driver's seat, because there stuff as you noticed under there. Last edited by Steve W; 05-30-2009 at 10:24 PM. bose is a *****, usually gotta replace entire system cause the bose stuff works differently. Thanks for the info everyone. So I'm still curious where the crossovers are for the non-bose system? is it in the PCM, amp, or inline in the speakers. I don't want to run double x-overs. We should probably wait for steve to comment on this, but I am pretty sure that they are not actually "at" the speakers themselves. According to the parts charts for OEM items, they never seem to mention crossovers when showing exploded diagrams of the doors and dash. Passive crossovers can be pretty small if they are handling 15 WPC, but they still need coils and caps, and they should be obvious on inspection. The easiest way to find out where the crossovers are, would be to see how many speaker outputs are on the back of the PCM. If there is one output for each speaker, I would guess they have active crossover. If there are 4 outputs, there must be a 3 way passive setup in the dash or doors. The mid and bass driver could run without a crossover (and sound bad in a near-field environment), but certainly not the tweeter. Anyway, Steve put together exactly what I have been wanting to do, so I will be out in the garage next weekend putting the system in! BTW, steve could you comment on where you picked up your power and grounds. Did you avoid any ground loop or noise issues?? - Where did you tap into the speaker lines for the high-level input of the amplifier? - Did that come from the amp in the trunk area? - Did you pull power and ground directly off of the battery terminals and where did you feed the wires into the cabin and where did you find the remote turn-on wire? - Do you have color coding info of the cables you tapped into? - Also where are the high-level inputs on the amp, I'm looking the Crutchfield pictures and I don't see them, I only see output. Last edited by epaulbb; 05-31-2009 at 10:56 AM. The “High” position on each “Input Voltage”switch selects an input sensitivity range between 800mV and 8V. This is for use with speaker-level outputs from source units and small amplifiers found in many OEM (factory-installed) systems. To use speaker-level sources, splice the speaker output wires of the source unit or small amplifier onto a pair of RCA plugs for each input pair or use the JL Audio ECS Speaker Wire to RCA adaptor (XB-CLRAIC2-SW). 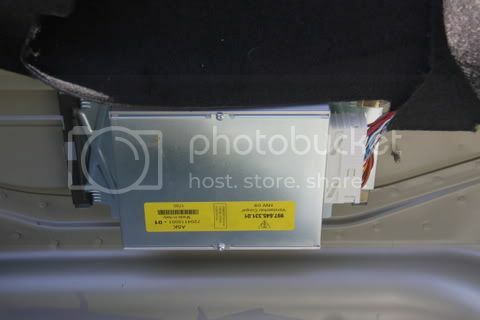 On the base system, which is just a pair of tweeters in the dash and a pair of 6" woofers in the door, I think the only crossover is a capacitor for the tweeter, mounted on the back. I haven't confirmed that because I haven't pulled it out but that's what I remember reading. I don't think it is any more complicated than that because that would increase production costs. I didn't see anything for the woofer when I pulled it out of the door. There is no active crossover coming out of the PCM or CDR, just full range left front, right front, left rear, and right rear. There's no signal equalization either, just full range. Only the Bose systems have some kind of signal equalization. It all is really that basic. For ground, there is a lug nut on the floor pan right below where I mounted the amp that was perfect. For power, I ran 4 gauge along the right side of the center console, then over to above where the gas pedal is, there is a 2-3" big rubber grommet on the firewall where I ran it through to the battery area. You can see it in the pic below. From there it goes to a 150A circuit breaker mounted on the battery tray, then to a 0.5 farad capacitor and the battery terminal. The capacitor is grouned to the same lug the battery is as shown in the pic. I have no ground loop or noise issues. The mounting board you see is actually a replacement for the original heavy steel battery tray, and is made of the same cutting board material the amp was mounted on. Weight savings 1.5 lb. It's for a CDR23, but the PCM and CDR24 are essentially the same. While the head unit was out, I took the opportunity to install a Dension 500 behind it. I installed the Ipod connector in the center console feeding through from a notch I cut in the coin tray piece. Steve! Incredible information, what I've totally been looking for. Last question... Do you know where to find a DIY that shows how to pull out the head unit? I noticed your GT2 had a different head unit than most of the 997 C2/C2S, so I'm looking for a DIY that show how to pull this out. So I was in my trunk today of my 2005 C2 and I noticed what I think is the amp. Does anyone know if this is the amp? See pics below. If so, anyone have the pinout colors for the cables, this would be easier for me to tap into vs. pulling out the head unit.